This week Seagate Technology re-released one of our videos to its subscriber base on YouTube. 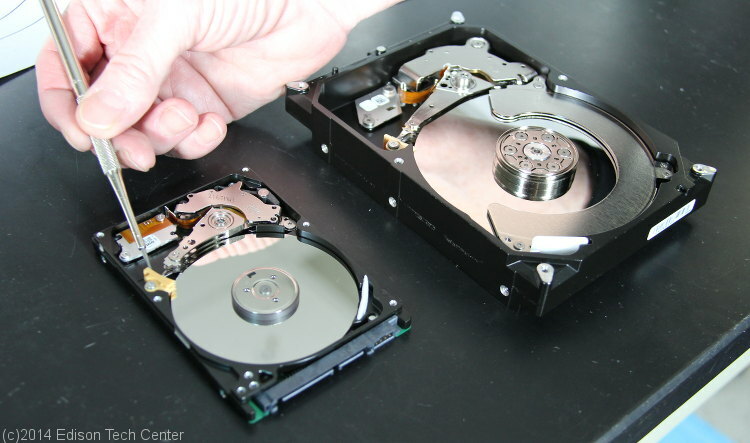 In 2014 as part of the Iron in our Electrical World series we covered magnetic hard disk drives as one of the many ways in which iron is used in electrical engineering. Engineer Joanne Larson did an excellent job of walking the viewer through the parts and basics of how a HDD works. Here are some photos and some basics covered. 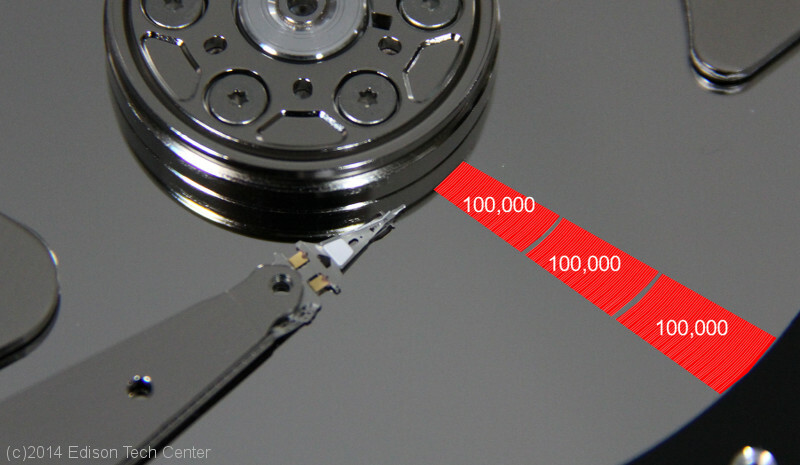 While you may visualize a hard disk as silver-colored disk spinning with an arm reading it similar to a record player, it actually is an array of disks with many read and write heads on BOTH sides of the disk. This is done to maximize the read and write speed and the quantity of data which can be stored on the disk. Above you’ll see the arm separated from the assembly. The read and write heads are positioned near the tip of the arms. The idea of the array of disks goes back to the first HDD made in 1956. Why is it called a “hard disk”? Today we use HDDs and solid state storage for computers. The disks are rigid and a fixture in a computer. But at one time we had “floppy” disk drives (FDD). 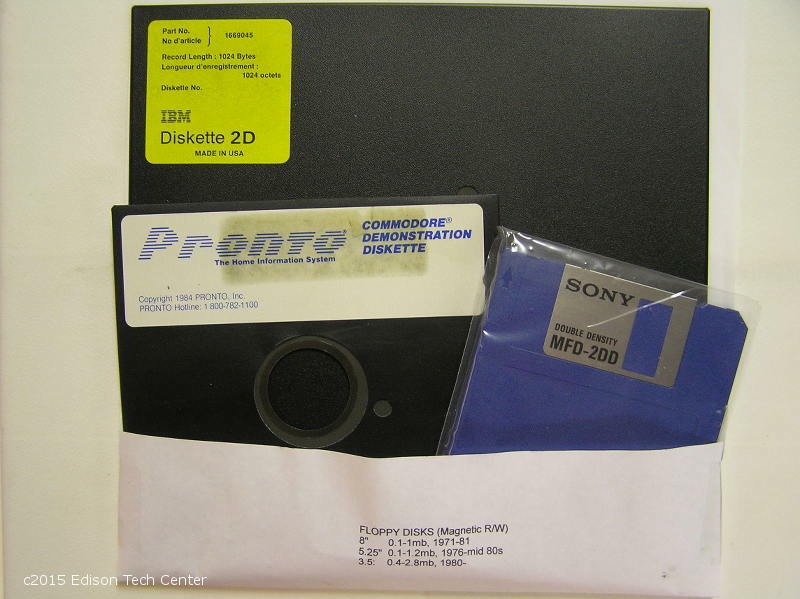 Both floppy and hard disks coexisted occupying different uses for many years. The idea of the floppy disk came from magnetic video/audio tape and the hard disk drive. As you will see from our webpage on Magnetic Recording audio/video data is recorded in a medium filled with tiny soft iron pieces, the iron bits would align themselves according to how the write head (a magnet) aligned them. You will see the head also called a “transducer”. This alignment of magnetic “directions” can be read later on and converted into an analogue signal. IBM developed the 8″ floppy disk called the Memory Disk (80KB storage) in 1971. Early engineers at IBM figured out how to use “reel to reel” magnetic tape (1951) to store binary data which had sections useful for given tasks that could be read later on by rushing through the tape to read from particular sections of the metallic tape. The problem with this is having to rewind/fast forward through tape. Transfer rates for the early tape started at 7200 characters per second. In comparison the common compact cassette tape used for music by the consumer had a transfer rate of 2000 bits per second. A flat “disk” of the similar magnetic data could be read faster by allowing sections to be read by their address or position on the disk. IBM developed the hard disk in 1956. The disk was an array of 50 24″ disks which could hold 5 million digits of storage. 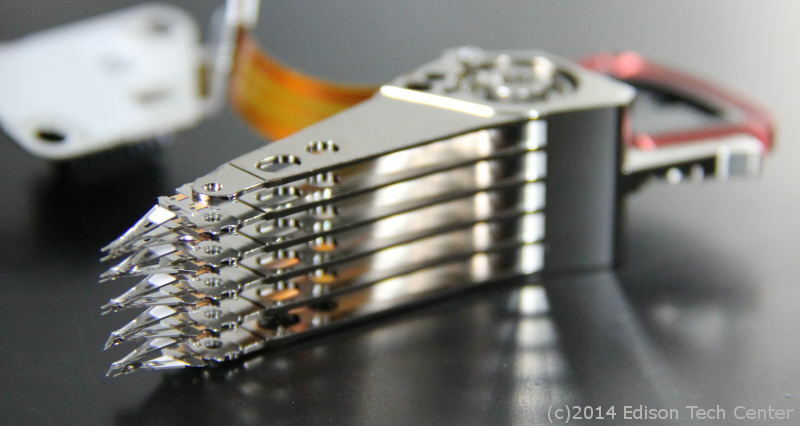 The need for higher density of data storage lead to advancement in magnetic storage technology. 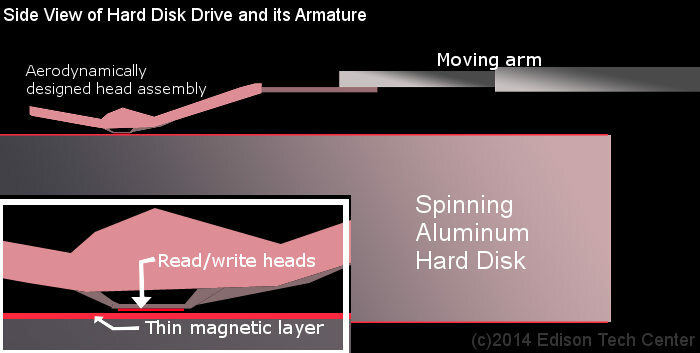 The hard disk evolved as an aluminum disk (aluminum is light-weight and allows for high-speed rotation without warping) with a magnetic coating on the outside. Many alloys have been explored to attempt to create the highest density possible while keeping the storage stable over a relatively long time. The job of engineers is very tough in HDD design as work must be done on a microscopic level and one must work with many fields of engineering. 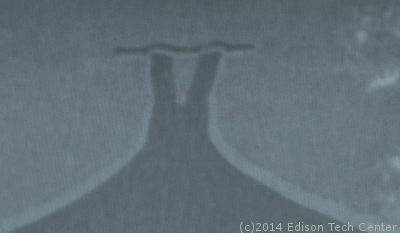 The write pole seen magnified 85,000 times. Some parts here are only a few molecules thick. Materials engineers, chemical engineers, mechanical engineers, electrical engineers all must work together to create a product that is better than any other before it. Each year the frontier of what can be done is advanced. All this work occurs on its own plane separate from the common media buzz. While marketing for Apple and other companies love to simplify advancements and declare that “optical data storage is dead” or that magnetic storage is the past, this is simply noise and not engineering. Throughout history engineers have surprised everyone by taking older technologies and breaking through a barrier that had stopped people in the past, this can result in a leap beyond the current popular method. Sony, Seagate and others are continuing to make advancements in storage density that help create new uses for magnetic storage. The Iron in our Electrical World Program is a collaboration of the Minerals Education Coalition and the Edison Tech Center. In the program we highlight the importance of materials engineering, the role of iron in our society and how this material is used in technology design all around us.